The race to represent Arizona's ninth district was too close to call until Monday morning. Kyrsten Sinema has officially been elected as the nation's first openly bisexual congresswoman, the Associated Press reports. The race to represent Arizona's ninth district was too close to call until Monday morning, when the AP announced that Sinema's lead had risen to more than 6,000 votes — a margin too large for her opponent, Vernon Parker, to overcome. 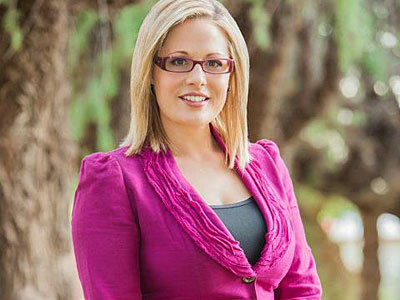 The Victory Fund, which funds and trains LGBT political candidates, backed Sinema's campaign. "We're thrilled for Kyrsten," said Chuck Wolfe, president and CEO of the Victory Fund, in a statement. "She's a dynamic leader and she'll be a strong voice for her community and for all LGBT Americans." Sinema had been optimistic all along and announced Sunday that she had gained votes against Parker. "On Sunday, after additional votes were tallied by the Maricopa County Recorder’s Office, Sinema increased her lead by an additional 1,079 votes. Sunday’s total brings Sinema’s lead to 5,789 over Parker, or 2.8%. We look forward to the remaining votes being counted and Kyrsten Sinema being sworn into Congress next year." Read more about Sinema here.